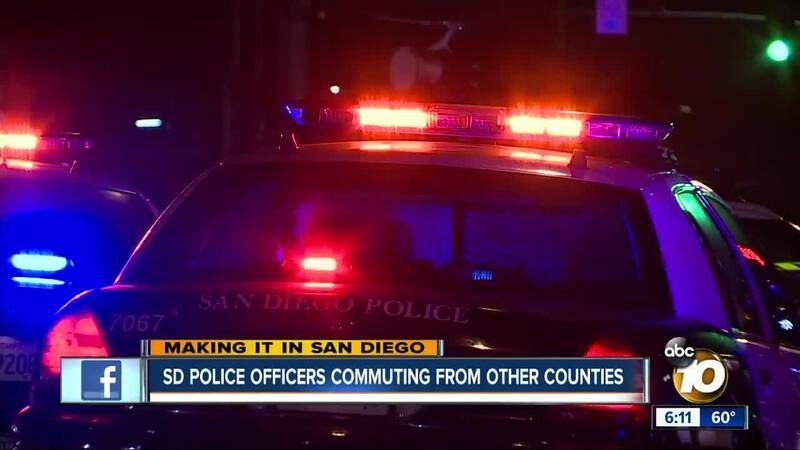 SAN DIEGO (KGTV) - Dozens of San Diego police officers are commuting to the city from other counties because they can't afford homes here. “I usually get up at 4 a.m. and get on the road at 4:30 a.m.,” says SDPD Sgt. Brian Avera starts each day in Temecula where housing is more affordable. He drives 60 miles into Downtown, San Diego. At the end of his shift, he drives 60 miles back home. “The job by itself can be stressful but adding a two-hour commute to the end of the day and doing that a few days in a row that can get to wear on officers,” he adds. Sgt. Avera is also a director at the San Diego Police Officers Association, where Detective Jack Schaeffer is President. “There's more and more officers having to move farther and farther away from San Diego to be able to afford to have the quality of life that they want,” he tells us. Det. Schaeffer says most officers are moving north. “Temecula, Hemet, Murrieta [and] Riverside area,” he adds. Exactly how many officers have moved there? “Conservatively, maybe 50 officers,” says Sgt. Avera. 10News asked the City of San Diego for data on the number of officers living in San Diego County, Riverside County and Imperial County, but our request was denied. The San Diego Police Department has been plagued by an officer-shortage due to the high cost of living and low pay. The city of San Diego's entry level officer salary is about $56,000. The City of La Mesa’s entry-level officer salary is close to $70,000. The City of Coronado’s is nearly $76,000. Last month, San Diego City Council unanimously approved hiring bonuses of up to $15,000 for SDPD officers. Additionally, officers who bring in recruits can earn a bonus of up to $4,000. Two years ago, the City Council approved a series of salary hikes of 25% by 2020. Even so, the City is still down about 180 officers. Sgt. Avera and Det. Schaeffer are optimistic, though. They believe the new salary hikes and bonuses will soon bring positive change for all the sworn SDPD public servants who are struggling to make it in San Diego.